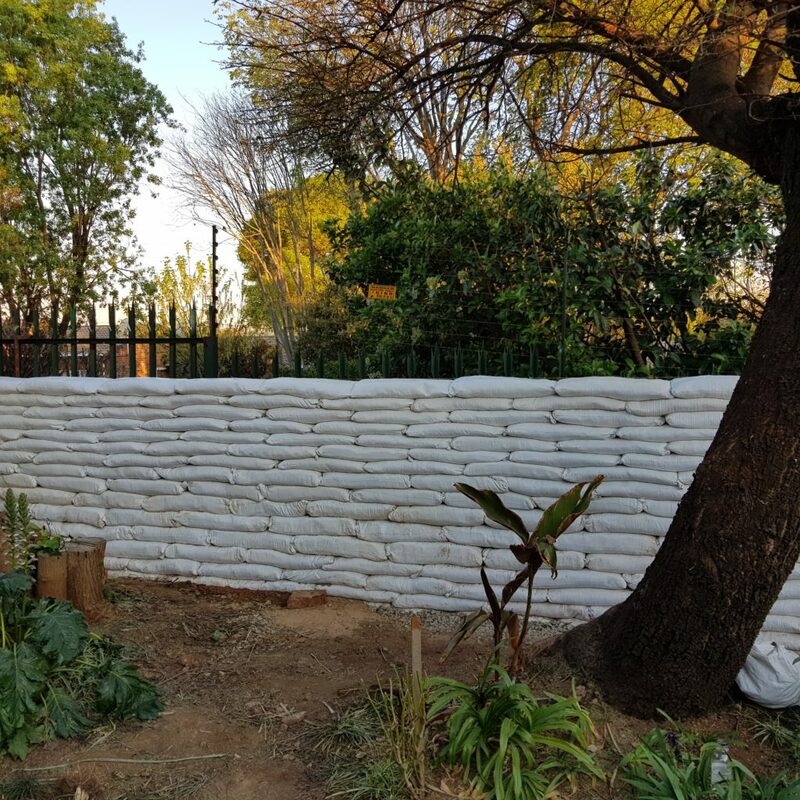 Wayne Talbot, a reader from South Africa, sent me these photos and description of an earthbag privacy wall that he just completed. I think that is very nicely done! 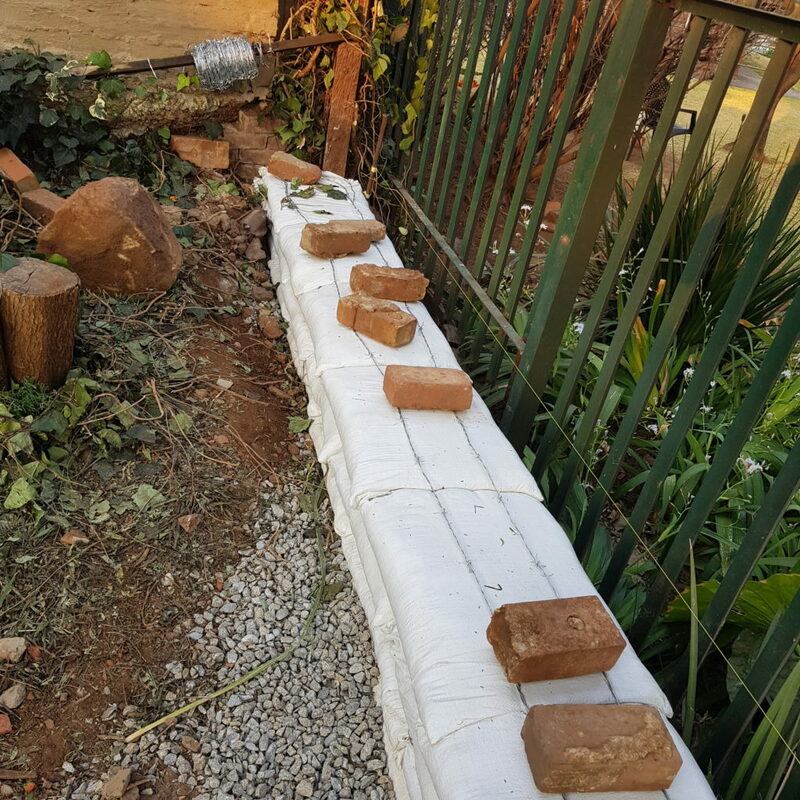 Inspired by Owen’s earthbag building resources, I recently completed the construction of an earthbag boundary wall. 11m L x 2.5m high. Bags filled with building sand and 6% Portland cement. Bags filled with building sand and 6% Portland cement. Chicken mesh attached to bags using roof nails. Initial plastering was done with a hand-held plastering ‘machine’ I got off eBay. Cost USD$140.00 delivered to S. Africa. Plaster is standard cement plaster. 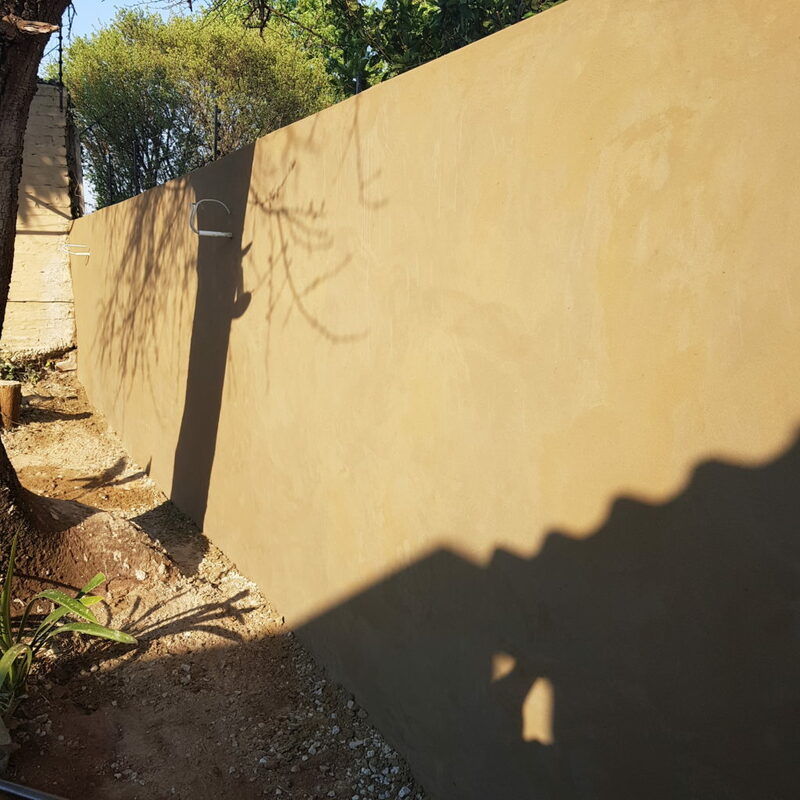 Top of wall waterproofed using ‘flash harry’ water proofing ‘paint’. Thanks again to www.naturalbuildingblog.com and Owen for the inspiration. This was just a ‘test’ project to get a feel for the technique. Next project will be an entire home (straight walls, contemporary house, Cape vernacular type architecture). Hi Wayne – Greetings from Botswana. Nice job ! …looks like a pro built it. I am trying to start a project here in Botswana and would like to ask where you sourced your bags from and price ? Hi Peter, lived in Gab’s for 5 years in the 90’s. Fantastic place! Got the bags from https://saknpak.net. Cost was +-R2.00 per bag Excl Delivery. Very cool! 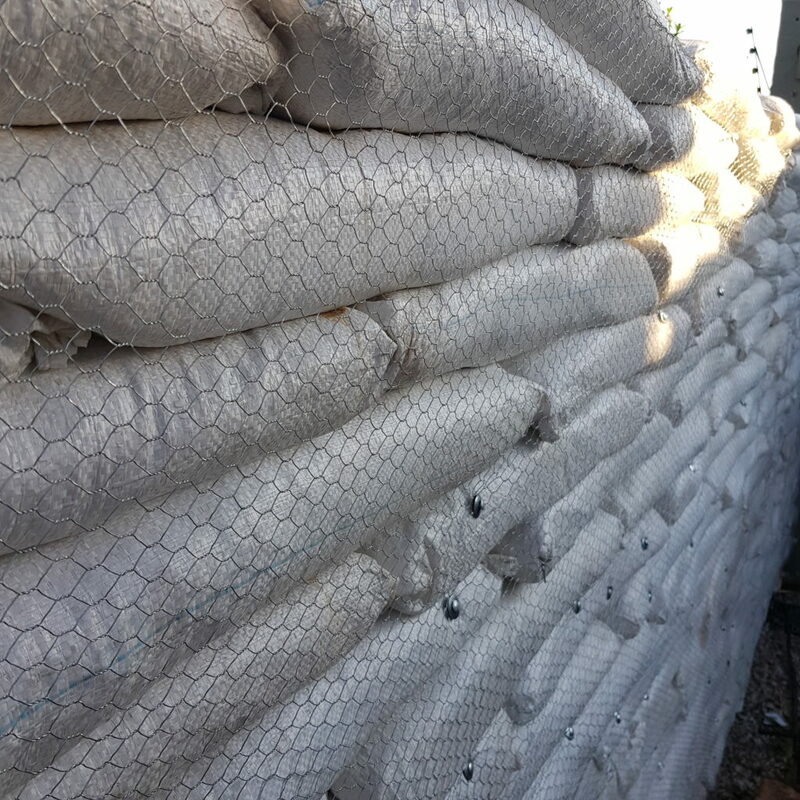 I’m on the verge of building a wall around my entire property and I am toying with the idea of using her bags instead of cement blocks. The cement blocks you’re going to charge me about 25,000 in the local currency, which is approximately US$5000. I will need to do the calculations, the plot is 200‘ x 90‘ squared, but I think I can do it for far less. Does anyone have any experience is with longer walls? I imagine I will have to put a few supports/retaining walls throughout the entire thing. 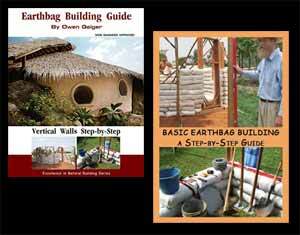 The rule of thumb with straight earthbag walls is that they need to be buttressed at least every 10′, especially if they are over about 3′ high. An easier, and perhaps more aesthetically pleasing way to self-buttress the wall is to curve it in a serpentine pattern. Good idea! 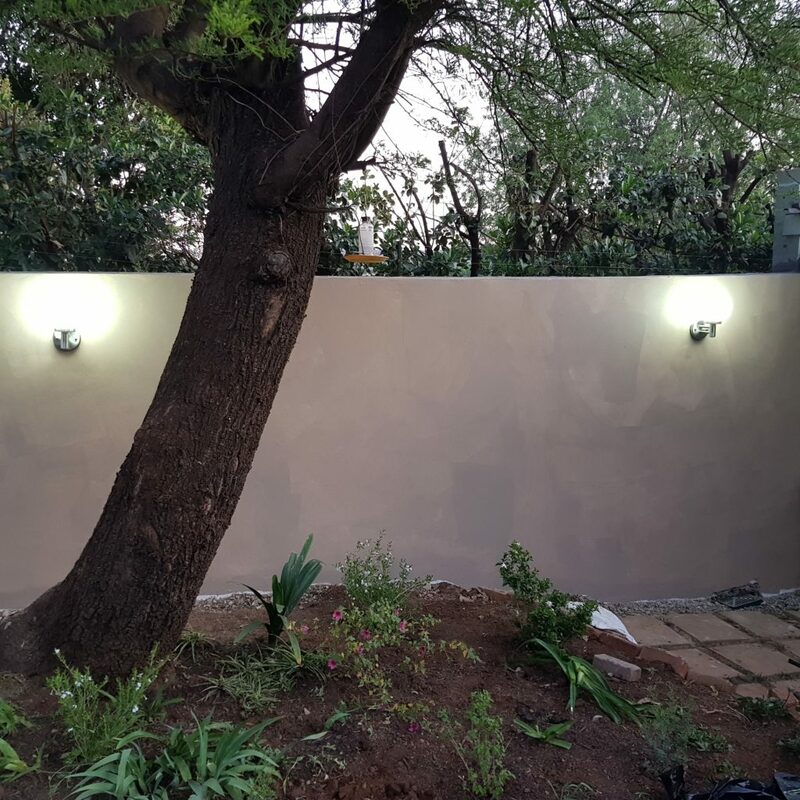 The front of the wall was already going to have a curve; I wanted to leave a tree that’s technically on my property accessible to the community members because the women forage for fruits there during the dry months. The curves will look nice. I also plan to use the tubing instead of individual sacks, so that design will be much easier to achieve. 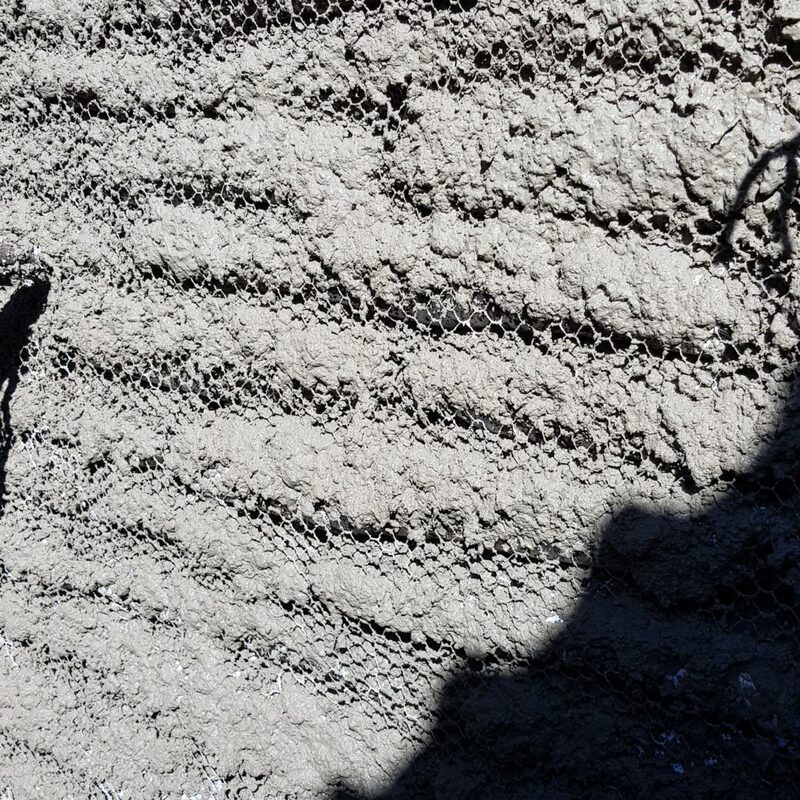 What about +-6 No 20mm rebar at the wall ends concreted at the base? Tehn 4x holes in the bags (20mm conduit in the bags so holes are easily aligned with the rebar) which drop over the rebar? Top of the wall, bonded beam?